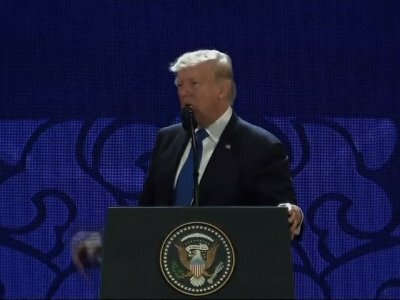 DANANG, Vietnam (AP) — President Donald Trump stood before a summit of Asian leaders keen on regional trade pacts and delivered a roaring “America first” message Friday, denouncing China for unfair trade practices just a day after he had heaped praise on President Xi Jinping in Beijing. But Trump added forceful complaints about “the audacious theft of intellectual property,” ″massive subsidizing of industries through colossal state-owned enterprises,” and American companies being targeted by “state-affiliated actors for economic gain” — without singling China out by name. The two men shook hands and spoke briefly again during Saturday’s meeting, according to a Fox News videographer who was the only American journalist allowed into the room. Journalists traveling with Trump were not permitted to observe any of the APEC events he participated in. Trump and Putin were also seen chatting as all leaders walked to an outdoor location for their traditional group photo.